Cream with a K (A.K.A Lee Tatlock) is a British - Tokyo Based musician, visual artist and model. Having spent the past 9 years in Tokyo, mentored in J-Pop throughout her teens with famous Japanese producers such as Takeshi Kobayshi and Hyadain, she is predominately know for previously fronting the Commercial Japanese Pop Group NEKO PUNCH (Universal Japan / ASOBI SYSTEM). Bilingual in Japanese and English, in Tokyo she is also recognisable media figure and was the TV host of the Japanese Rock music TV Show, NHK’s “Nippon Rocks” Series. 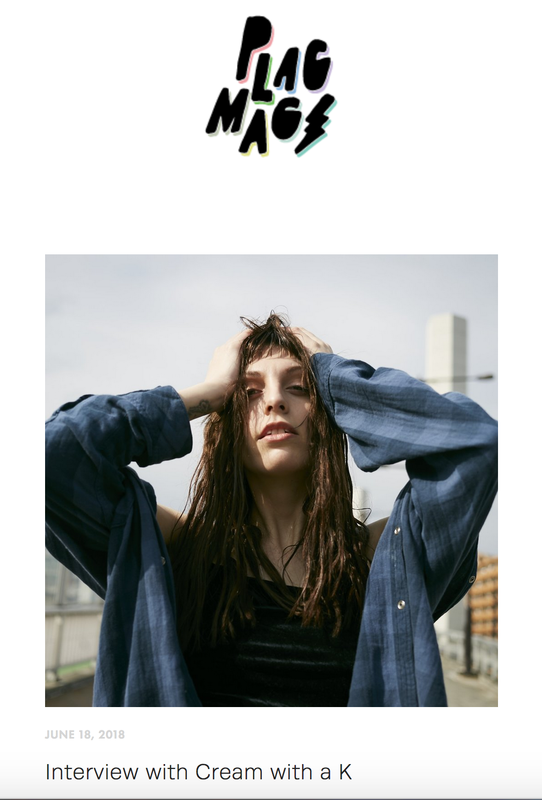 She is seen as a link between the UK and Tokyo music scenes. After 3 iTunes Top-Ten 10 singles and winning the EMI REVOLUTION ROCK Award, having achieved success in Japan, it was only after a chance meeting in Tokyo with one of her biggest inspirations, BECK, she decided it was time to reconnect with the West and make music that was better aligned to her new ideas and vision. "Cream with a K" is an entirely self-written, recorded and produced pop-project thats draws on influences from 90s Grunge Rock and Refined Art Pop. She also turns her hand to fashion styling, Creative direction, Music Video direction and editing. She pre-released her Self Titled LP "Cream with a K" directly to CD at Tower Records and other stores in Japan July 4th 2018. Within 3 days the CD sold out domestically on Amazon Japan. 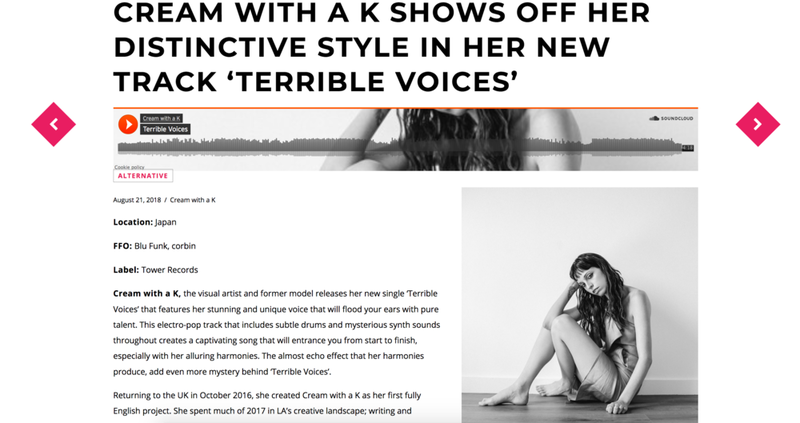 Cream with a K made her first digital international release with the ethereal, grunge, pop song “Terrible Voices” on August 10th 2018, followed by woozy alt track “5:35” Oct 26th. The latest single “Stuck in the House” was released Jan 16th 2019 with great applause from press in the west. Grand Prize Winner of EMI REVOLUTION ROCK Award. 3 Top 10 iTunes Chart Singles with Former Group NEKO PUNCH. Fashion, Tokyo “IT” girl for brands including; Sonia by Sonia Rykiel, M Missoni, Paul Smith, CANDY TOKYO and Regal Shoes. Appearance in various fashion/music/culture magazines such as Good Rocks, Barfout, Nylon, Vogue Girl, WWD and Cosmopolitan. Model for Yoji Yamamoto, Marc Jacobs, Lowe in Tokyo shot by Leslie Kee. 3rd Single “Stuck in the House” Out Now!